Mads Francis isn’t your typical fashion illustrator. Boasting over 70,000 followers on Instagram, this Melburnian has also caught the eye of world’s biggest stars including the likes of Rihanna and the Kardashians. We’re excited to announce that Mads will be opening a pop-up at St. Collins Lane, where you can purchase custom illustrations or attend intimate workshops to hone in on your illustrating skills. In the lead up to her opening – we sat down with Mads to give you a look into the life of one of Melbourne’s most coveted creatives. 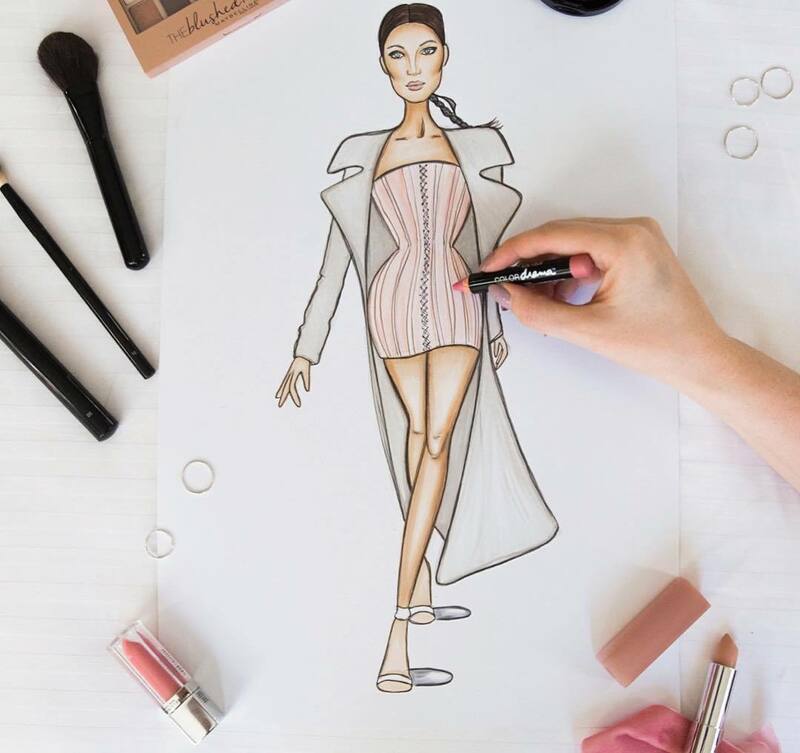 I studied Fashion Design at Kangan Institute and fell madly in love with my illustration classes. Instagram had just taken off and my boyfriend at the time set up an account for me and I began posting my work. Before I knew it, Rihanna had followed me, and the work started to flow in! The Kardashians recognising my work was definitely a turning point for me! I was featured on Kim’s blog a few times and was commissioned by Khloe to create a piece that now hangs in her home. As I work from home, coffee always comes first and then I normally try to get on top of emails. After that, my typical day-to-day usually varies, but I might have a client meeting, or if not, I’ll shoot some content if the lighting is right. I often catch up with fellow illustrator Sarah Darby as well as we love to work together. Any time that I push myself out of my comfort zone. One moment that stands out was when I was asked to paint a life-sized pair wings for Virgin Australia. I hadn’t really painted much before that and they turned out really well, so I was so proud of myself! WHO HAVE YOU BEEN THE MOST STARSTRUCK BY? I was quite starstruck when I worked with Megan Hess. She was the reason I got into illustrating, so when I worked with her in Doha, that was a big moment for me. Meeting Kendall and Kylie Jenner would be up there as well. YOU’RE ALWAYS FLYING OFF TO WORK IN EXCITING PLACES! WHAT’S YOUR FAVOURITE PLACE YOU’VE BEEN? My favourite place so far is definitely Doha in Qatar – they really know how to do a wedding! The best thing about travelling as an artist is being able to be freshly inspired and I always come back with a million ideas! I love Architectural Digest for interiors and I think Will Smith is doing an epic job of his socials at the moment, I can’t get enough of him! On the art front, I love following Artline and Copic because it’s so inspiring to see what other creatives are doing! A lot of Copics and Artline Fineliners. I also use makeup in my work such as bronzers and eyeshadow palettes. WHAT DO YOU WISH YOU WERE TOLD ABOUT ILLUSTRATION AND SOCIAL MEDIA WHEN YOU WERE STARTING OUT? Ahh so much! Ultimately when you jump into freelancing, you are starting a business, so I would have liked to have known more about the business side of things. With an illustration, in particular, I would have loved a crash course on how to price my work and the fundamentals of usage rights – all the “boring” stuff that’s so important! WHAT’S SOMETHING MOST OF YOUR FOLLOWERS DON’T KNOW ABOUT YOU? That I draw, shoot and style all of my content. WHAT CAN WE EXPECT FROM YOUR POP-UP AT ST. COLLINS LANE? I’m really excited to be popping up at St Collins Lane! I’m looking forward to holding some fun classes over the school holidays, as well as nights and weekend classes. I’m so excited to see what everyone produces! Croatia, I could live there. LAST PLACE YOU TRAVELLED TO? I spent the summer in the Northern Hemisphere, travelling around the US and Europe! Mads Francis’ pop-up with be opening on Level One on Saturday, 10 November.